In accordance with our mandate, DFWAC offers services to women and children victims of violence who are defined by law 15/2007, which established the Dubai Foundation for Women and Children. Service provision is defined by the Law. Women and children experiencing any type of abuse or violence. Not in immediate danger of harming yourselves or others and/or in need for a psychiatric hospitalization. Not infected by a contagious disease. Not male of 12 years or over. 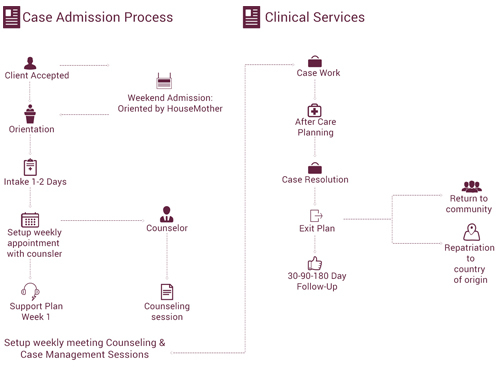 It includes conducting a case study by contacting the important family members to involve them in finding solutions that serve the client's status, and communicate with various departments and local departments or external relevant if needed. If the case manager noticed any disturbing psychological indicators on the client, DFWAC transfers the client to the psychiatric department after filling clinical remittance form, then the client receives psychological services of individual therapy sessions, group therapy, family therapy, play therapy in addition to the psychological support groups. DFWAC has a permanent legal advisor to support the clients and provide them with legal consultations and advise them on the best ways to communicate with the legal entities in the UAE, and to educate them about their legal rights and the right methods to go on with all the legal procedures such as opening a case file and other procedures. DFWAC provides sheltering services for urgent cases that is transferred from the official entities in the UAE in addition to the cases that face immediate danger that can put their safety at risk. These services include temporary housing under the supervision of a high qualified team that works around the clock in addition to providing the sheltered cases with all their daily needs of food, clothes, transportations and other needs. DFWAC provides educational services for the received cases, in schools, universities and other institutes in collaboration with the concerned bodies. The Foundation also provides scientific and cultural courses in addition to languages, computer and other courses. DFWAC provides a free of charge helpline service (800111) for all the residents of Dubai and the UAE 24/7, that aims to provide an efficient and professional response for everyone, as anyone can reach this helpline to get more information about the foundation's services, calling for urgent help, consultations and to get more information about the causes of violence against women and children. The helpline call center employees are highly trained on receiving all types of calls and to evaluate the client's status to determine the type of the needed service. Our Care & Rehabilitation department provide its services for the clients who are not in need for sheltering in spite of age or gender, as it provides them with all the social, psychological and legal services that will support them. – A comprehensive assessment of the client and accept her if the nature of the problem coincided with the Foundation's standards. 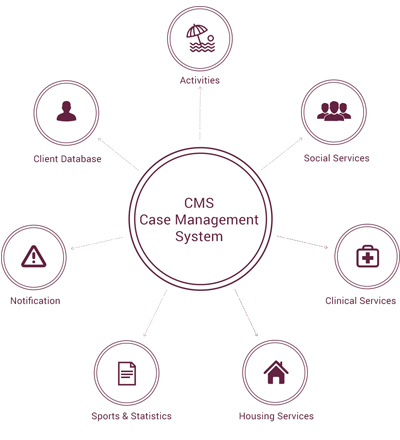 – A Case Manager is allocated to each client to follow up on all residential and medical procedures and then taking notes of the history of the abuse. -putting a supporting plan for each client that will be implemented and evaluated regularly. -putting a transmission plan to make the client ready for involving normally in the society.